The Iowa Aviation Museum is proud to announce the 2014 inductees to the Iowa Aviation Hall of Fame: Iowa's 3 members of the famed Doolittle's Raiders; Cpt. Charles Greening, Sgt. Bill Dieter and Cpl. Leland Faktor. Reacting to the damage done by the Japanese' sneak attack on Pearl Harbor on Dec. 7, 1941. 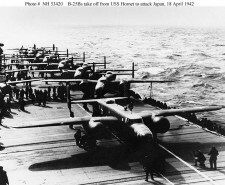 An ambitious plan was put into motion; led by Col. Jimmy, on April 18, 1942 sixteen B-25 "Mitchell" bombers flew off the aircraft carrier USS Hornet to bomb targets on the Japan mainland. Not knowing of the mission until the carrier was at sea, the volunteers were simply told, "you'll either be heroes or in heaven." The secret task force was spotted and the bombers forced to depart early knowing they didn't have fuel to reach safe territory. Iowans Dieter and Faktor were two of the three crew members killed when their bombers crash landed. 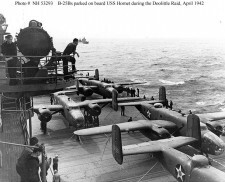 May 24th, 2014, all 80 members of the Doolittle Raiders were awarded the Congressional Gold Medal: "The raid provided a critically-needed morale boost for the American public. 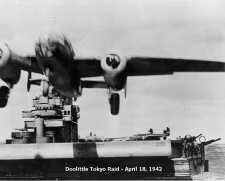 It also proved "to the Japanese high command that their home islands were not invulnerable to American attacks and [caused] them to shift vital resources to their defense."